The number of tractor-trailers, semi trucks, and big rigs on U.S. roadways has risen drastically in recent years. Sadly, as more and more large trucks take to the nation's highways, the rate of accidents and fatalities related to these tractor-trailers continues to climb. Whereas many accidents between two cars do not result in serious injury, crashes involving a large truck commonly do. This grave potential for serious injury stems from the physics behind any accident that involves a tractor-trailer and car. The enormous, often 80,000 pound truck holds the potential to cause severe damage to the much smaller 3,000 to 5,000 pound motor vehicle. 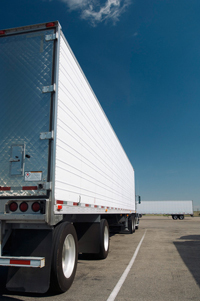 Large truck accidents account for over 4,800 fatalities across the U.S. each year. According to the National Highway Traffic Safety Administration, one out of nine traffic fatalities are the result of collisions involving a large truck. In addition to this alarming rate of fatalities, another 100,000 individuals are injured in tractor-trailer accidents annually. There are several factors that can contribute to occurrence of the above critical events, including: unsafe operation by the truck driver, poor truck maintenance, truck driver inexperience, distraction, mechanical failure, and truck driver fatigue. Truck driver fatigue is a particularly common problem among long-haul drivers. Fatigue is defined as the tired, sleepy feeling a driver experiences while operating a commercial motor vehicle. Long hours spent on endless stretches of road, tight deadlines and demanding schedules all contribute to this condition and can result in impaired judgment of the truck driver behind the wheel. Overloaded trucks are another common cause of trucking accidents. Exceeding the mandatory weight requirements leads to unsafe driving, making the tractor-trailer difficult to control and brake in time to avoid an accident. In addition, overloaded trailers, shifting loads, or trucks improperly loaded can cause problems such as flying debris, jackknifing, or overturning. Jackknifing and rollovers, though not as common as other types of truck accidents, can result in critical injury to the driver or other motor vehicle operators, as well as massive damage to the vehicle. It is important for all truck accident victims to remember that insurance adjusters work for the insurance companies and do not have your best interests at heart. Often, insurance adjusters will make settlement offers during the very early stages of an injury claim - before the full extent of the injured person's injuries are even known. It is critical that truck accident victims understand the motivation of the insurance adjuster. Adjusters are paid to minimize the value of your claim and provide you with as little money as possible. Accordingly, you should never just accept a quick settlement without consulting with a licensed truck accident attorney. At Montlick and Associates, our experienced Atlanta truck accident attorneys will protect your legal rights to the fullest extent. Do not tackle the insurance company alone; put our firm's 35+ years of legal experience to work for you. If you have been injured in a tractor-trailer or other large truck accident in Georgia, you may have the right to compensation for your medical bills, lost wages, and pain and suffering. In some cases, you could also pursue punitive damages. There are many different sources of possible recovery for truck accident victims, and the experienced truck accident attorneys at Montlick and Associates will explore every possible avenue. Further, we will investigate the causes of the trucker's negligence which may include fatigue, distraction, mechanical failure, or road conditions, and probe the claims history of the trucking company to determine if the company itself has failed to maintain safety standards. The Georgia truck accident lawyers of Montlick and Associates have the knowledge and experience you need. Our passionate and knowledgeable staff is ready to fight for your rights to get you the compensation you deserve, as they have been doing for over 35 years. At Montlick and Associates, we take care of the complicated legal issues so that you can get back to what is really important - getting healthy and returning to your day-to-day life. If you or someone you love has been injured in a truck accident, please call us today for your free consultation at 1-800-529-6333. You can also use our 24/7 Live Online Chat or our Free Case Evaluation Form. It won't cost you anything to see if we can help. No matter where you are located in Georgia, we are just a phone call away, and we will even come to you.